Without him, I exist not; without me he is unmanifest. Mother (Mirra Alfassa) and I are one but in two bodies; there is no necessity for both the bodies to do the same thing always. In an amusing incident after the passing of Sri Aurobindo, the Mother Mirra Alfassa found that certain observations she had made were identical to what he had written down. Nirod is reading me his correspondence with Sri Aurobindo. Strangely enough, there are all sorts of things that I said much, much later, I had no idea he had written them! Exactly the same things. I found that very interesting. Sri Aurobindo left behind many beautiful verses in Savitri alluding to the unique relationship between twin souls. These are some of them. Or their own wedded being’s vaster frame. Carlos Castaneda discusses twin souls in his books, calling them the Nagual man and the Nagual woman. In Edwin Arnold‘s poem Light of Asia, a free adaptation of a biography of Gautama Buddha, we discover that his wife, Yasodhara, had been known to him in previous lives – once when they lived in a forest, and once as a tiger and tigress. This is another selection from the Light of Asia where Gautama Buddha recalls one of past lives with Yasodhara in the form of a tiger and a tigress. Past things and thoughts, and buried lives come back. Sniffing the paths for track of man and deer. Into the wild with proud steps, amorously. Yes, it makes sense, and it seems that Sri Aurobindo accepts this Platonic idea. l know in the “Evening Talks” Sri aurobindo talks about a Spirtual connection between man and woman as Purusha and Skakti and also about sharing forces between two psychic beings. He also says that your wife isn’t necessarrily your shakti [ as in the old shastric sense ]. Soul-kinship (reference to the Rs [Richards]). This is from Record of Yoga, page 478.
i have gone through it myself and i can say twinflames or twinsouls do exist. And souls who get to meet their twins in their lifetime are realy very lucky as it is the ultimate love any person can ever experience. Only those who hv experienced this reunion can explain hw powerful n lifechanging it is. When l see this woman on a regular basis [sometimes not] who l’m inclined to believe is my twinsoul, l feel an incredible Energy in the body. lt took me a while to figure out what it might be. l’ve felt the Descent of Force etc in the Yoga, but it seemed a little different. Only much later was l able to confirm that the Energy and The Force [shakti] were actually the same. Sometimes this Energy builds up in my body, around solar plexus or heart region and then [when it’s ready to burst] l suddenly bump into this person. Only thing that l think was different, is that the Energy is much more lntense with the Twinsoul experience and tends to build up in the body rather than Descending from above [might have that wrong, though]. l think the twinsoul energy might have been a Psychic Energy/Force – ls this possible? Has anyone heard of the Psychic acting in this way??? Also, l’ve read about something called ‘Sacred Sexuality’ on some of these twinsoul forums. This sounds like some kind of Tantric practice [is it the Left Hand of Tantra?] which l obviously don’t agree with as l don’t think it has anything to do with Sri Aurobindo and Mother’s yoga. Has anyone had any dealings with this kind of thing??? Thanks. I have not heard anyone speak of the psychic Energy building up in the body as if it were about to burst. The psychic is initially felt as a tiny flickering light very deep within the heart which, if properly nurtured, grows into a fire (the seer-will Agni) that cleanses the chaotic frontal personality and brings equanimity. One experiences eternal contentment whether one is alone or with anyone in particular. You may want to look for other indicators of someone being a twin soul like shared dreams or uncanny coincidences in life. It’s easy to go wrong in these matters and regret later. > Has anyone had any dealings with this kind of thing??? I don’t know anything about sacred sexuality. Based on the following entries in Sri Aurobindo’s spiritual diary “The Record of Yoga”, it seems that he was exerting his yogic power on the Mother’s body as well. Jan 12, 1927: The final dealings with this body begin from today. The first stage of them finishes with the end of the month. And with her body it begins from tomorrow. At present it is the preparation of the forces. Jan 14, 1927: The attack on her body yesterday flatly denies the “Thursday” prediction. In this body there is evidence of control, but not of any final progress. The obstruction to finality is still successful, still obstinate. For this body the evidence is tomorrow; for hers it is veiled and will only appear day after tomorrow. Jan 17, 1927: It had been predicted that something would be done in six days for the healing in her body, that is by the 17th., and in fact a great relief and amelioration is evident; but not the decisive cure that had been taken to be the sense of the promise. Jan 19, 1927: The crisis in her body continues in all its adverse acuteness. The causes seem to be not personal, but due to circumstance favouring blind surrounding physical and vital physical influences. Jan 21, 1927: At last the power seems to be acting on the body. As predicted, there are the first signs of amelioration in her body, though nothing yet is complete or in appearance finally decisive. Still the black obstruction has failed to persevere. Jan 21, 1927: The action on health in both bodies is more evident but not yet entirely conclusive. l suppose ‘complementary soul’ would imply someone who has the same Spiritual Destiny or Goal and would also necessarily have the same capacity too. l mean SA said that he and The Mother had shared their destinies right from the beginning of creation, l believe. So, l think this would agree with the Twinsoul theory about the ‘SPLITTING’ of one soul in two – or l think l saw it in Savitri about Two Flames separating [twinflames]. The main thing l’ve noticed with my possible twinsoul is the heat-centre expanding from the chest like a big cloud of pinkish-white light and then forming a bridge which goes to her. Also, after seeing her physically sometimes there is an incredible descent of peace. Could this be false??? Can the hostiles create such peace – l know they can masquerade as just about anyone/anything? The Mother is bound to underrate her contribution. We have to introspect on the remarks that both made about each other and find the happy median. Mike: Also, after seeing her physically sometimes there is an incredible descent of peace. Could this be false??? 3) do both of you have similar dreams? 4) write down your 10 favourite words (vocabulary) and see if there are any matches. This provides a window into the subliminal consciousness. 5) for a few days, imagine someone else is your twin soul and see if you have similar experiences. Thanks for those suggestions Sandeep. Unfortunately, l don’t have verbal contact with her. That’s what makes this so strange – we are like strangers at the physical level. l do have quite realistic dreams about her and we talk in those. ln fact l had one last night [l don’t have that many – say every couple of months, so they’re not commonplace]. l’ve had so many weird and uncanny things happening over about six years that it would fill a large journal lol. These uncanny happenings are obviously enginneered and the timing behind them is perfect. Try not to laugh at this, but a lot of the uncanny stuff [around the begining] was to do with an ancient egyptian queen [nefertiti] , believe it or not. This appears to provide another connection with The Mother, who would have been nerfertiti’s stepmother or perhaps mother knowing what the egyptians were like…[mother says she was queen tiye in that life]. l had absolutely no interest in Egyptian antiquities etc before l met this woman, then it came at me from everywhere. There is a full statue of this queen which is the spitting image of this woman. l found out in a mysterious way that they discovered the famous bust of nefertiti on my birthday. One day l found – almost on my doorstep – a full deck of playing cards on the sidewalk, facedown, with the picture of nefertiti on the back of every card and a pink line running through two of them. l don’t want to bore you with this stuff, sandeep. l’m just pointing out some of the uncanny synchronicities and if you want, you can delete this post if you think it’s too crazy, lol. l’ll try it, but if l did experience these things with someone else, what would that mean? l don’t really think it’s down to imagination and l’ve never had these experiences with anyone before or after l met her – except of course SA and Mother. ln the past l’ve felt strong attractions to people and had strong imaginings about them, but l experienced nothing on the same scale as l have with her and l should say, that before meeting her, l knew nothing at all about Twinsouls etc…. ln the beginning l had no attraction to her and even now there is nothing sexual in it [thank God]. l still feel strongly drawn to some people but nothing like l’ve described with her, ever happens. The intensity of it goes beyond any vital or chemical attraction that we ordinarily feel with some ppl. l know your possibly not qualified to answer these things [probably only SA and Mother can decipher all this] but l’m putting them out there for others who might be going through a similar experience – either now or in the future. Mike: l’ll try it, but if l did experience these things with someone else, what would that mean? Don’t know. A possible test to distinguish psychic love from vital love, but based on your description, you may not need it. Mike: l’m putting them out there for others who might be going through a similar experience – either now or in the future. Ok. Lets wait and see. l tried imagining other women as my Twinsoul today. The strange thing, is that everytime l do this the face of the woman l think is my twinsoul, automatically comes into my mind. l’ve also noticed that quite often whenever l have a strong thought about this woman, l feel a strong energy or force moving through my body. Thats funny and fascinating 🙂 Your twin soul must also want to be with you in the same way, otherwise it gets complicated. Good that mike is not married to the twin soul other wise in few years will think as twin evil, sorry its true as marriage can do this magic.As said strange or stranger is our own mind. But whatever may be the case still surrender and all getting rid of lower nature all stays the same struggle so not knowing on these i do not see what’s the benefit of having a twin soul ,one thought still need purification,karma yoga is required all stays same. Hopefully mike does not take it wrongly.He has wonderful spiritual changes for the twin soul and thats noticeable but the complication starts when does not keep them as spiritual relation.It’s Mother’s Grace and let her handle and not interfere with human ways. Yes Sandeep ;), if it’s only one-sided i can’t see how it would work, but l believe from many indications that She is aware of what’s going on. l’m just not sure how much she knows yet. There has to be a Spiritual Destiny involved l think, otherwise it’s just a meaningless attachment. l’ve seen a lot of ppl writing on Twinsoul Forums about this stuff [never seen anyone doing this Yoga on them, though] but l think a lot are possibly desperate and delusional. They only want some kind of vital relationship, l think. There are one or two that actually have a Pychic connection, l think. Sri Aurobindo also said [albeit around a 100 yrs ago] that the meeting of Twinsouls is as rare as hen’s teeth – not in those words, of course lol. So, we have to be very careful about making these claims. That much is obvious. lt’s ok ipi, l completely agree. lf this twinsoul thing isn’t about the Yoga then l’m not interested. l actually prefer the Term ‘Spiritual Partner’ to ‘Twinsoul’, but since Sri Aurobindo used the word [and ‘complementary soul’ too] l suppose it has importance for the yoga. He does say that we can have all the Realisations without a twinsoul [of course at the time, He was talking to male disciples, but the same would apply to women as well. l imagine], but for the Supramental Yoga the Shakti is important [as with the Mother] for the physical manifestation. lt’s beyond my feeble understanding, but He did say that in the ‘Evening Talks’, l think – or that letter to Dip Kumar Roy about marriage. Yes, marriage can be a nightmare [50% ending in divorce l believe] lol. lt’s not something l’ve ever entertained really. Never appealed to me. Of course Mother has put people together, l believe ,when she saw a True Psychic connection there. l mean, even Satprem was with Sujata. Funnily enough, l had a dream about Mother a few days ago, about this twinsoul business. l was having a nap and found myself in some strange place [l don’t think l recognized it] and then Mother came from somewhere and She was wearing either a Crimson or Violet coat [3/4 length] and this Twinsoul stuff came up. She was looking at a sheet of paper about me and this woman. Then She said something about someone ‘ being hurt by a comment’. This is exactly what happened, actually, and it caused a lot of friction between me and the possible Twinsoul. l tried to ask something, but Mother interrupted and shut me up lol [She doesn’t like questions ):] and then went off to get more information, l think [ sounds ridiculous, l know] and told me She’d be back, so l waited. However the dream ended, but if it was genuine She’ll be back. l totally agree simbi. Actually, looking back, l think she arrived after l asked SA and Mother for a Spiritual Prtner to share the Yoga with. Then the twin appeared shortly after. l had a strange dream with this twinsoul of mine last night. l only mention it because it seems to be connected to the Yoga. A few days previous to this l had asked for this twinsoul to be protected because l sensed she was being dragged down by those around her. Anyway, some days later l get this dream about her [l don’t have many dreams with this person]. l was with her in the dream and she says – ” every night you tell me ‘DURGA is with you’ ” – perhaps l’d been getting on her nerves lol. This is very strange to me, namely because l’m not aware of being with her every night and l never think about Durga [it’s always been the Mother]. So, l had to google stuff on Durga to find out more. Of course, l knew She was created out of the 4 goddesses, but then l found SA’s hymn to her and the bit where the Mother convinced her to surrender to the Divine. So, it seems to be an answer to my request. The next day l saw [apparently by accident because l wasn’t looking for it] a documentry on tv about DURGA [ l did remember seeing it some time ago but it came very quick after the dream]. lt’s very rare to see anything about Durga where l live [even on the tv]. l don’t know about this. The Mother might have answered by sending Durga – it makes sense somehow. “Sujata Nahar: Loving Homage. Compiled and Edited by Nirmal Nahar and Anurag Banerjee with a foreword by Samir Kanta Gupta. Published by Overman Foundation, Kolkata. No. of pages: 150. Price: Rs. 120. Anurag Banerjee—the editor courageous has done it again. His perseverance has paid off handsomely as the effort is larger in its scope and amplitude than what one could have imagined. This publication provides immediately an ideal platform and an opportunity to take us off deeper in unraveling the mystery shrouded around the life and the sadhana of Sujata and Satprem during their long years of exile from the Ashram and the great departure from this earthly scene to their true home in the bosom of the Divine Mother . Anurag Banerjee has a knack of springing surprises – but this publication titled simply as “Sujata Nahar – Loving Homage” surpasses all the previous ones and fulfils our expectations in ample measure and sets right several events in true perspective as we glean through the letters, tributes and the interview with Nirmal Nahar. This book depicts the heroic saga of the twin souls who stood firmly against all odds on the bedrock of their inner convictions and certitudes that the mission and challenge of the supramental transformation would go on until the end as the Divine Mother had wished and ordained them to accomplish. Satprem finally confirmed this to his dear confidant ‘Le travaille est fait’ in glowing written note announcing that the Work Is Done! The unflinching quest of Sujata and Satprem for the supramental fulfilment can not be written about singly focusing only on one personality. They were inseparable in life and more so Beyond life. Therefore, these loving homages reveal to us much more than what simple tributes would have done. These revelations altogether shed a new light and discoveries of their supramental sadhana and the unspeakable struggles. Satprem the one who loves the TRUTH as the name suggests, was very dear to Douce Mere. She chose Satprem and Sujata as the trusted instruments to record for posterity Her experiences of the different stages of the Supramental transformation down to the very cells of the body. Year after year Satprem and Sujata were the sole recipients of the supernal mysteries of the arduous supramental transformation as SPOKEN to them by the Divine Mother. One has only to read the Agenda to know the flaming intensity with which each experience in minutest detail was conveyed by Douce Mere to Satprem and Sujata. These were the dialogues of the pathways to Supramental infinities and epiphanies—the UTTAMAM RAHASYA—the supreme secret when the time stood still. The Divine Mother had implanted and ignited the Supramental AGNI in the heart and Mind of Satprem which did not allow him to rest until the WORK was accomplished – and Satprem along with Sujata worked tirelessly to realize and manifest the Supramental Truth NOW and not some time later. Their souls were oceaned by super life aspiring beyond heaven to touch, to clasp and be the image of the Supramental Godhead. Slowly and slowly they dug deeper and deeper into the very heart of the Supramental mystery and, finally, the Son of Earth emerged with resplendent glory and a cry of victory as the worthy inheritor of the Supramental Legacy: Le travaille est fait—The work is done— rapturously exclaiming to Sujata that it was the victory of our Mother – Our Mother – Notre Mere ! One has only to imagine the depth of Satprem’s feeling and the boundless love for the Divine Mother and Sri Aurobindo. “Loving Homage” is, in a sense, a veiled biography of Sujata and Satprem expertly produced and edited through a collage of letters and reminiscences by distinguished luminaries and friends who loved Sujata and Satprem. This publication has also introduced a new and fresh genre of work in and through which we get the glimpses of the hitherto unknown facts of the life and the supramental sadhana of the twin souls in exile. “Sujata Nahar: Loving Homage” has also put to rest once for all the unsavoury controversies surrounding the intentions and motives of Sujata and Satprem and their whereabouts. As a detached observer we see that Sujata and Satprem emerge unscathed in all this as they were carrying out only the will of the Divine Mother. We read with delight the insightful letters and tributes which are heart warming and intimate in their adoration and bring out the innate gracious sweetness of Sujata-di—a soul of Light and Delight. We also note the amazing versatility of Sujata-di as a luminous writer, an astute compiler and a sharp communicator par excellence at once fearlessly frank. Satprem wrote ceaselessly as well and his writings are marked with the powerful Upanishadic seer-vision and prophetic touch. His celebrated book Sri Aurobindo or The Adventure of Consciousness has already become a classic. Editorial is a ‘tour de force’ what Anurag Banerjee set out to do—and has done in meticulous detail through dazzling array of letters and tributes—was to authenticate the vision and mission of Satprem and Sujata-di which he regarded as TRUE. It is almost a biographical note of the twin souls covering the wide spectrum of their supernal lives. A gracious foreword by Ronju-da [Samir Kanta Gupta] gives a perfect start of the book . Appreciations are also due to Nirmal Nahar and Suprabha Nahar for their fruitful assistance in making this publication an immensely fruitful and joyful venture—an adventure of consciousness and Joy. There are indications in the Agenda that Sujata was with Satprem in the past three lives and they had both committed suicide. On February 3, 1962, the Mother tells Satprem : “The only thing I left untouched was the constructive part of the bond that had existed between you two, and so when she met you, she….”. The Mother cleansed Sujata of the Karma of the suicide but Satprem continued to suffer, which is why he always felt restless and suffocated. “Because before you were told about your karma, I had already seen certain things about you and was trying to set you free – not from the thing itself, but from the tendency that remained in your nature. That, yes. But Sujata, for example, was completely, COMPLETELY free of the whole … (what shall I say?) what could be called the unhappy aspect of her karma – completely free. For I know the people around me and what they carry with them very well, and there was nothing – just one thing remained, the one part that was rather constructive, so I had left that totally intact. And when the events of her past life were revealed to her, I took the greatest care to destroy the revelation as it was being given. And I did it ruthlessly. You see, it was like dumping a load of mud on someone completely unsullied, and I didn’t let it happen (I couldn’t stop what entered through her physical brain, but inwardly … I utterly annihilated it). The only thing I left untouched was the constructive part of the bond that had existed between you two, and so when she met you, she…. That’s all I left, because it was good, pure, lovely – it was good. But all the rest…. And you saw how strongly I protested when I was told she had committed suicide. “No, no, no!” I said; even if somebody with perfect knowledge were to tell me so, I’d still say NO. I am told by a friend that Satprem’s book “The Sannyasin” which is autobiographical in nature also covers this aspect. To begin with, I must tell you a dream that I had here in Rameswaram a few days after my arrival. I was being pursued and I fled like an assassin – it is a dream I have had hundreds of times for years, but in this dream, there was a new element: while being pursued, I climbed a kind of stairway to try to escape when suddenly, in a flash, I saw a feminine form hurtling into a void. I saw only the lower half of her body (with a kind of mauve-colored saree), because she was already falling. And I had the horrible sensation of having pushed this woman into the void, and I fled. I climbed, I climbed these stairs with my pursuers close at my heels, and the image of this falling woman gave me a horrible feeling. When I reached the top of the ‘stairs,’ I tried to close a door behind me to stop my pursuers, but there they were, it was too late … and I woke up. The last time I was in Rameswaram, I had two other very poignant dreams, but I could not make out what they meant. In one dream I was strangling someone with my bare hands; it was an abominable feeling. And in the other, I saw, in a kind of nocturnal setting, a hanged man being taken down, with all kinds of people bustling about the corpse with lamps, and suddenly I knew that this hanged man … was me. I had said nothing to X about these various dreams before he told me the story of my last three existences: three times I committed suicide – the first by fire, the second by hanging, and the third by throwing myself into the void. During the first of these last three existences, I was married to a ‘very good’ woman, but for some reason I abandoned my wife ‘and I was wandering here and there in search of something.’ Then I met a sannyasi who wanted to make me his disciple, but I could not make up my mind, I was ‘neither this side nor that side,’ whereupon my wife came to me and pleaded with me to take her back. Apparently I rejected her – so she threw herself into the fire. Horror-stricken, I followed her, throwing myself into the fire in turn. That was when I created ‘a connection’ with certain beings [of the other worlds] and I fell under their power. For two other lives, under the influence of these beings, the same drama was repeated with a few variations. During the second of these last three existences, I was married to the same woman whom I again abandoned under the influence of the same monk, and I again remained between two worlds wandering here and there. Again my wife came to plead with me and again I pushed her away. She hung herself, and I hung myself in turn. During my last existence, the monk succeeded in making me a sannyasi, and when my wife came to plead with me, I told her, ‘Too late, now I am a sannyasi.’ So she threw herself into the void, and horror-stricken by the sudden revelation of all these dramas and of my wife’s goodness (for it seems she was a great soul), I threw myself in turn into the void. lt’s strange because l seem to find this sort of information by accident – or not. Thanks for that info sandeep. l hadn’t read that – must have totally missed that in the agenda, although, l haven’t read it word for word yet. lt’s strange that Mother never once used the term ‘Twinsoul’ like SA did. l know She used to last at the idea of ‘The ONE’ when people romantically [vitally] alluded to this, but can we allude to the Twinsoul as ‘The ONE’ in a Spiritual or Yogic sense. What l’m not clear about is whether SA mean’t that we all have just ONE Twinsoul – or is it just someone that we have the same Spiritual affinity and capacity with and also the same aspiration for the same Goal. ln effect, this would suggest that anyone with these affinities would be a TWINSOUL and that the original Platonic theory of split-apart soul [two halves of the same soul or perhaps two flames from ‘one’ flame as in Twinflames] would be fallacious. “”Every human being has a twin-soul. When man leapt like a spark from the bosom of his Creator he was two-in-one, and these two parts complemented each other perfectly, each was the others twin. These two halves became seperated, they took different directions, and they have evolved seperately. If they come to recognize each other at any point in their evolution, it is because each carries the image of the other in the depth of his being, each has put his seal upon the other. Thus, each carries the image of his twin-soul within. The image may be blurred but it is there. For this reason, everyone who comes to Earth has a vague hope that he will find a soul who will be everything he needs, and that with this soul he will find indescribable harmony and perfect fusion. Twin-souls complete each other; no other person in the world can so complete them. Thus, all beings you have met since the beginning of your multiple incarnations, all the husbands and wives you’ve had, all the lovers or mistresses, have all left you, because they were not for you. Perhaps you were together for a while, like a pot with a lid that doesn’t match. Wheras two Souls whom God has created together are absolutely made one for the other, and nothing can seperate them, truly, they have no fear of being seperated. Sould be ‘laugh’ not ‘last’. Daily Meditation: Friday, April 29, 2011. “Even after several disasters and disappointments, how many of you insist on believing it is not your understanding of love that is defective; it is simply that you haven’t met your twin soul yet! As if happiness were just about meeting someone… Unfortunately, that is not how things happen: a twin soul does not appear as a man or woman you meet by chance, and it’s love at first sight. The meeting with your twin soul is, first and foremost, a psychic process, whereby the higher part of you attracts its complementary part. You need to have worked for a long time and shown yourself worthy of your divine half. But when you have finally established the connection, you feel him or her there, living inside you. Strangely, he seems to be referring to some of the issues that have been mentioned on this board, like the Mother talking about ‘love at first sight’ – a purely romantic and vital notion which again seems to have very little to do with the meeting of Twinsouls. There are quite a few books out there already, but there is only one l can really identify with, mainly because the authors were followers of SA and Mother [and even in their case, it took 25 years to get the right information]. Also, there are so many authors today writing about Spiritual things that they’ve never experienced. l don’t feel it’s right to do that, no matter how good the reason. l remember SA saying something about this in reference to the author of the book ‘Cosmic Consciousness’ – Richard Bucke, l think. lt was written years ago. l believe Bucke had some kind of experience which he apparently termed ‘cosmic consciousness’, but SA thought was a nothing of the kind, l think. Yes, but the qualification for talking about Twin souls is surely less stringent than that required for Cosmic Consciousness. For instance, take Dr. Bucke’s case. It is evident there has been some experience. It must be the case with many other people in Europe. Immediately they break a little out of their brain-mind they begin to generalise without waiting to see quietly what the experience is about. They do not allow the experience to get settled. If Dr. Bucke had waited and tried to see how what he calls “cosmic consciousness” comes, what are the conditions of its experience, and what it really is, then he would have found that his generalisation that “the cosmic consciousness must come all of a sudden” is not correct. But, for me, l feel we need the Psychic consciousness or the Psychic realisation before we can actually KNOW what a Twinsoul is. 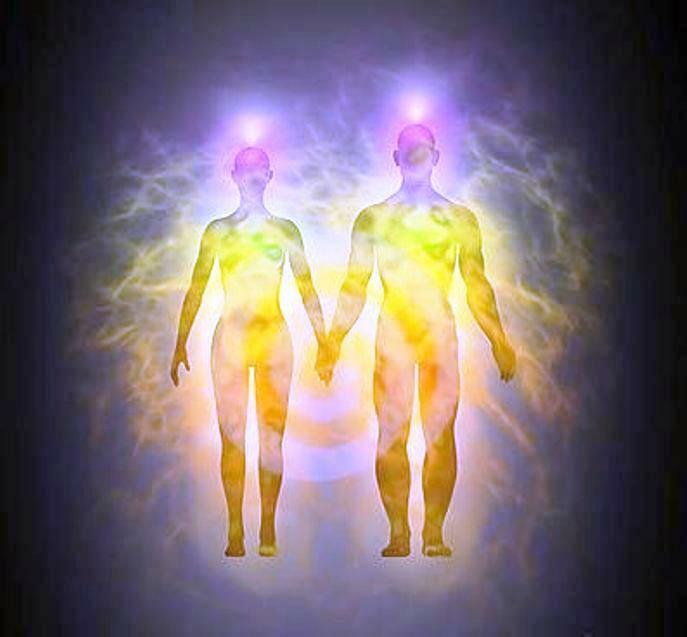 This is why, l think, SA told the early sadhak’s that they wouldn’t understand, because according to Him, Twinsouls need to be united on every level of their inner beings. He also said they’d have to understand about the exchange of energies going on between two souls, before He could discuss it further. l’ve had some experience of this exchange of forces, as mentioned previously, but not enough to truly know what’s going on at the Soul level. Actually, lt seems like talking about ‘cosmic consciousness’ would by be a lot simpler than discussing Twinsouls LOL. lf SA and Mother want to write a true account of the Twinsoul phenomenon, they might do it through me, although l think there are probably much better instruments for that purpose. l do have a strong feeling, though, that this Twinsoul business has an important place in the future of the Supramental Yoga. But, for the moment it’s just speculation. Sandeep, thanks to you and your friend for the extra info on satprem and sujata. Those dreams must have been a nightmare for satprem in itself. These past-life dreams seem to stand out more than the ordinary subconscious chaos. l know that most dreams l have of this woman [possible twinsoul] are always vivid and easily remembered. Some might also be past-life contacts with her – l’ll have to take more notice of the the surrounding environment next time [and what l;m wearing]. l suppose X must have been the same sanyasi that came between them in previous lives. He also says that Twinsouls meet 12 times throughout all their incarnations on earth [doesn’t seem like much but who knows]. The last time is when they fully re-unite completely. lt seems like satprem and sujata were trying to come together in those previous lives but the timing was all wrong – that’s why the sanyasin was allowed to interfere, perhaps. Probably, they had to wait for the supramental yoga of SA and Mother before the Purusha and Shakti in them could collaborate in the right way – just a guess lol. I doubt this remark applies to everyone. The vast majority choose a mate purely out of subconscious desires. Only those who have some psychic development in previous lives might have such a perception. I have heard that before in India as well. Can’t recall where though. We are all soulmates l think – those of us who have a soul that is – it’s just an undeveloped Psychic Presence in most from what l understand. l believe we probably belong to ‘soul families or soul-groups’ and reincarnate throughout many lives with these particular souls. However, ‘soulmates’ are not the same thing as ‘Twinsouls’. From what l understand, we only have one Twinsoul – that’s the general opinion – or perhaps they are just souls that we are very compatible with and destined to follow the same path with [same capacity, perhaps]. ln my case l simply asked SA and Mother one day [don’t know why] for a Spiritual Partner in the Yoga…[l knew nothing about twinsouls at that point] and then this person suddenly, and through mysterious circumstances, appeared out of the blue, shortly after. Then a whole series of weird Psychic and occult experiences started happening [like kundalini becoming more active – l think this is the progressive aspect SA talks about]. Soulmates come in all kinds of relationships, according to the theory. Your probably surrounded by many of these anyway, in the form of friends, enemies, family, workmates etc…. l had a strange dream last night with Sri Aurobindo [at least l recognised this person as the Master]. ln it He told me that a certain restaurant where l happened to meet the woman l believe to be my Twinsoul, is strongly connected to or pervaded by ‘BHRINJI’. I hadn’t a clue what this mean’t or even if l’ve got the spelling right – also, l’ve never heard the name before in my life. l asked SA if it was the lower or higher vital that was entering the place – He said no. One of the most amazing forms of Shiva and Parvati is that of the Ardhanarishvara – half-man and half-woman. It is laced with symbolism. There are also numerous stories associated with the appearance of Ardhanarishvara. One of the most popular stories is the one associated with Sage Bhringi disrespecting Goddess Parvati by worshipping only Shiva. Sage Bhringi was a great devotee of Shiva but he refused to accept Mata Parvati as a Goddess. He never offered prayers to Mata Parvati and this infuriated her as she was the Shakti – the female energy. The sage performed circumambulation of Shiva daily but ignored Parvati. Parvati would not allow that. She sat on Shiva’s lap making it impossible for the ascetic to pass between them. When Bhringi took the form of a bee to fly between their heads, she merged herself with Shiva so that she became his left half. Now Bhringi took the form of a worm and tried to bore his way between them. Parvati was not amused. Despite Her protests, Sage Bhringi continued to worship only Shiva. To teach the arrogant Sage a lesson, she abandoned him. The Sage had not realized that Goddess Parvati is also Annapurna – the one who nourishes all living beings. The sage deprived of Mother’s support became weak and thin. Soon he could not even stand. The benign Shiva could not abandon his ardent devotee, so he gave the sage a third leg like a walking stick. Sage Bhringi used this additional leg to circumambulate Shiva and still ignored Mata Parvati. So, why SA would be telling me this [like l said, l’ve never heard of this bhringi before, let alone the story], l’m not sure, but the restaurant where l met this twinsoul woman was also the place that caused a separation between us later on down the road. l imagine Bhringi represents something hostile coming between me and this person, which definitely happened, l believe [bhringi obviously tried to come between Shiva and Parvati] – SA has mentioned how hostile lower types [if it’s not our own ego’s, that is] will try to break a twinsoul connection…. so perhaps that’s what He was telling me. Very strange dream, though but gladly accepted lol. I believe He has arranged this meeting with this Twinsoul person right from the start or definitely had a part in it, because of certain experiences which indicate His influence or intervention. bhupriya, l think your referring to the ‘evolutionary form’ that the Psychic Being uses through each incarnation. ln other words it’s the ‘BODY’ OR FORM of the ‘Psychic Being’. Just like we have a ‘subtle body’, ‘Vital [astral] body’ and a ‘Mental Body’ – the Psychic Body would be the inner-most body. Although, somewhere on the blog SA is quoted as saying the Psychic Being’ doesn’t actually evolve or grow with each incarnation – it’s the outer personalities or beings that evolve. That doesn’t sound right to me. l’ve read SA an M saying that the Psychic grows and have described some Psychic Beings as ‘VERY YOUNG’ and others as being ‘OLD’. l’m not sure SA definitely said that, it sounds like a misinterpretation or perhaps wrongly reported by a sadhak..
How do you or Sandeep search for these quotes or info from all the voluminous writings and letters of SA & M? I always wondered how Sandeep can find the relevant info and its reference whenever replying on this blog…. Is it by using find option on the pdf files? That website doesn’t open for me, it’s not working somehow. I know that is strange since I used to refer to it all the time. Mike– thanks for the google suggestion, I will try to search more using google! There is also a search function on this blog which can be helpful. And, the listings on the right side will take you to certain things like ‘Psychic Being’ etc. ln google if you search for something like : aurobindo “Psychic Being” age – it will bring up many answers and links [the first being this blog]..
Google has many ways of searching.. The link works for me ok.. Sorry it was a false alarm. The link is working. We are not here to answer all your elementary questions. You should take some time and read Sri Aurobindo on your own. (Not sure why your comment went into the moderation queue). lt is strange that it needed moderation. Perhaps the new avatar icon.. although my usual icon is still next to the emailbox below..
karass – A group of people linked in a cosmically significant manner, even when superficial links are not evident. duprass – a karass that consists of only two people. This is one of the few kinds of karass about which one can have any reliable knowledge. The two members of a duprass live lives that revolve around each other, and are therefore often married. “A true duprass can’t be invaded, not even by children born of such a union.” The novel cites the example of “Horlick Minton, the New American Ambassador to the Republic of San Lorenzo, and his wife, Claire.” The two members of a duprass always die within a week of each other. Yes dimobilous, even though that is fiction from Kurt Vonnegut ‘s novel, lt actually has an element of truth, l believe, because l’ve red something very similar by the well-known japanese yogi Hiroshi Motoyama. He said that the Higher-Self can manifest as two people in this world, and that they usually marry and then die around the same time – it’s strangely similar to vonnegut’s story. The idea of ‘twinsouls’ is an ancient concept, which plato described quite well – this is probably where vonnegut got the idea from. Sri Aurobindo was talking about ‘Twinsouls’ well before vonneguts novel, cat’s cradle came out in 1963.
lt’s quite possible that vonnegut actually believed in the reality of ‘twinsouls’, because even though he was an atheist or agnostic, he did believe in the superntural..
P. S. http://en.wikipedia.org/wiki/For_You,_Humanity! This painting seems to me to explore in the best way an essence of twinflames. Yes, dimobilous, your right, l hadn’t thought about them. Obviously, max theon and Madame Theon were Twinsouls. From one person’s gaze, however, he could not hide his real identity. She was an young English poetess. It was in one of the parties that he met her. His keen eyes noted her calm and luminous face. Their first handclasp was like thunder and lightning, revealing to them in a flash their deep-seated harmony of being.”.. Sorry for offtopic, but I don’t know where to post this. Sandeep, did that cool couple (ha!) wrote anything about ahimsa? Any ahimsa tips? What violence is? Where does it originate? I never read so much poetry in my life, like I did on this blog, huh. I prefer lyrics, poetry doesn’t make sense to me without music. Although I have one poem that I like, I guess I’m mono at least in poetry, haha. Sri Aurobindo was not in favour of Ahimsa in political life as practised by Mahatma Gandhi. He considered it as a misapplication of saintliness to the political spectrum. He said that “Politics is the work of the Kshatriya (warrior) and it is the virtues of the Kshatriya we must develop if we are to be morally fit for freedom (from the British)”. The Kshatriya (ruler, soldier) may have to fight a battle if required but it must be done for a higher noble cause, instead of purely out of hatred or lust or greed. As for the general question on the nature of violence : at a personal level, it is due to an imbalance in the consciousness and one must learn to observe oneself and forsake it. Tor a person who seeks spiritual life, one has to rise to a level where one does not succumb to bouts of violence. A person who lives in the Higher consciousness (Brahman) is said to influence non-violence around them. Ah, brits… Well, maybe they’ll finally leave EU. Long essay? More like book fragments! I liked it. I didn’t knew it actually had a name – passive resistance. In Poland there are still some communist sentiments leftover and for many people, including the government, being businessperson is being enemy of the state. It’s crazy, not everyone can be simple worker! But I guess in their eyes everyone has to be either in the government or simple worker, nothing in between. So, while government is ours, sometimes it’s so against some groups of it’s own citizens, that it creates regulations that almost render business impossible. And what bosses do then? They change contract type, company type, lay off employees, all kinds of workarounds to still be able to work, everything without breaking a law. I didn’t knew it actually has a name.